Waking up at 11:30 means I slept for 11 hours, which is a long time for me. Even with that I felt completely exhausted and even wished I was home, a feeling I seldom get on these trips. 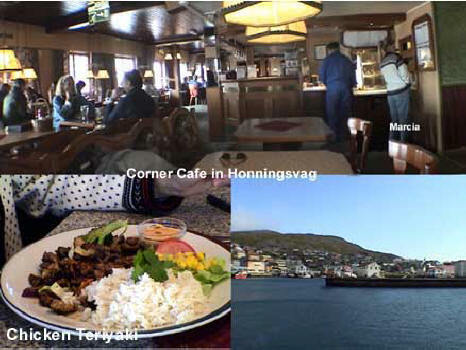 At noon we arrived in Honningsvåg, the closest port to the North Cape. 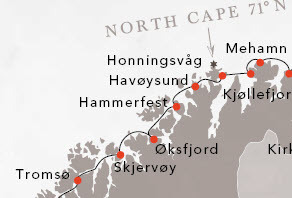 The map (right) shows our overnight voyage from Tromsø to Honningsvåg. It was still very foggy when we pulled into the port and hard to see. 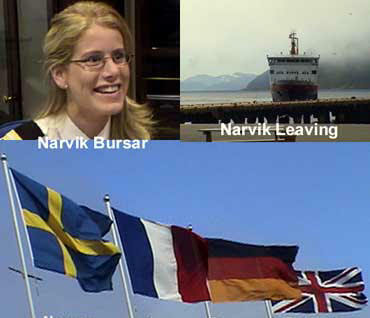 I settled up with the ship's bursar (below) who was very nice. At 12:30 I drove the car off the ship using the same elevator system and we were on our way again. We decided to drive throughout the entire town and get the “lay of the land”. We discovered very rapidly that there wasn’t very much "land" to this town. 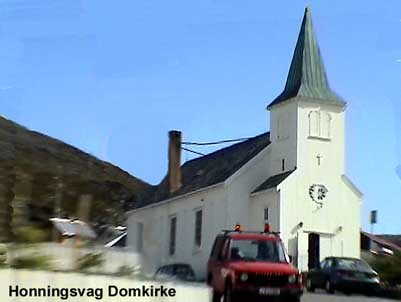 In the east part of town we drove by the city’s Domkirke (main church, above) and wended our way to the Tourist Bureau back where we had disembarked. We went inside and discovered it was not only a Tourist Bureau but a Tourist Gift Shop as well. 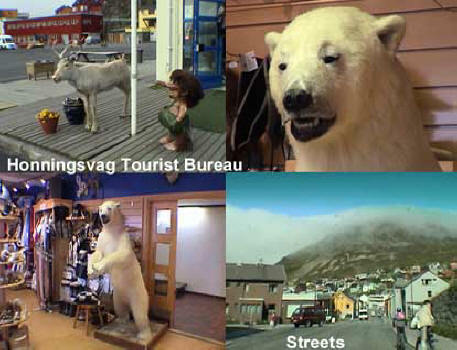 They had a lot of neat stuff including a giant stuffed polar bear (below left.) As we left the shop we noticed the M/S Narvik had moved from where it left us off to another wharf to do something else. Now Marcia’s stomach was grumbling again and we had to find a place for her lunch. We walked around the very small town and found the only place that looked half way decent. We walked into the Corner Café [, +47-] (above right) at 1:30 and found it rather inviting with its views of the harbor and the sea. Marcia had to stand in line to order her lunch which was chicken teriyaki with rice, tomatoes and corn (above right.) After she ate, Marcia called her mother in Rockland, Maine. 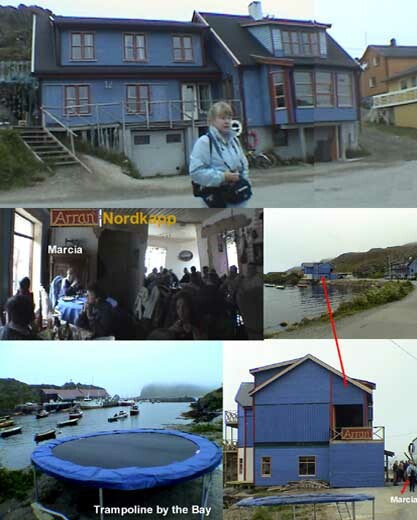 I called the Nordkapphall (the Nordkapp Center [+47-7-847-6860]) to see how late they were open and they informed me they were open all night long but the restaurant was completely booked for this evening. They told me the area was totally fogged in and there would probably not be a good midnight sun to view. I then looked through my ScanPass book and reserved a room at the Hotel Tegnérlunden in Stockholm for the week of 7/30-8/7. 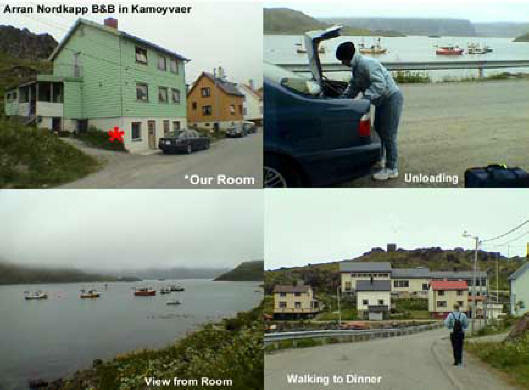 At 3:30 we checked into the Árran Nordkapp Hotel [, +47-7-847-5129] (above) which really was not a regular hotel. The main building was quite a way from the apartment rooms we stayed in. After they gave us the keys and the directions we drove back to the building our room was in and unloaded our bags. As you can see (left) they were rather sparse. Remember, there was no place available in this area for this night, so we were grateful to have a bed to sleep in. By now it was getting pretty nippy and we were bundled up for the cold. 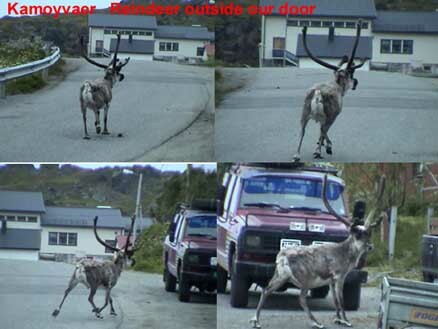 After we got into our room and settled in, I took a little stroll outside to look at the bay across the street and there was a large male reindeer standing in the street in front of our car. As I approached him, he hightailed it down the road and ran off. Later I met the people in the room next door. They were an Italian couple who had driven their motorcycle all the way from Italy. 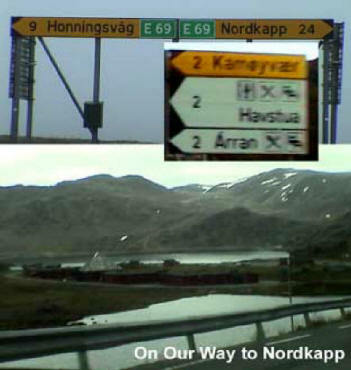 They told me this was one of the great challenges of Italian motorcyclists, to make it all the way to Nordkapp. When we finally left for dinner, we decided to walk over to the main hotel. 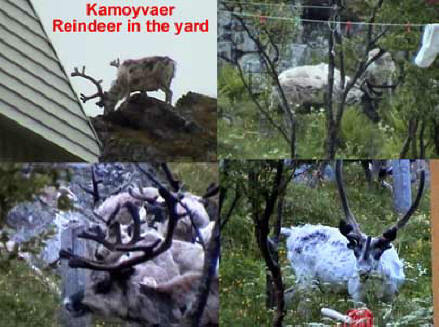 As we left we saw a herd of reindeer (above right) walking all over the property. It was really neat. On the way to the hotel (right,) we noted that one neighbor had a trampoline outside his house. I wonder what that is like here in January. You could feel the letter N in north as we walked through this isolated little town. We reached the very quaint establishment of the Árran Hotel and I decided to have a cappuccino since I hadn’t had one all day. We sat in the reception area and I worked on the computer until I realized I needed to do my run for the day. I went back to the room and changed and by 5:30 I was running through the town but it was very tough because the hills were extremely higher than I had imagined. But I did it. I changed and got back to the restaurant and after waiting a little while we sat down to dinner at 7:30. 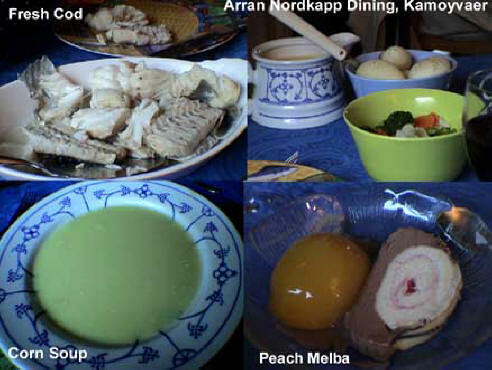 We had wine, coffee, cauliflower soup, fresh cod with boiled potatoes and vegetables of cauliflower/broccoli/carrots/peas. For dessert they served us a peach with ice cream. It wasn’t gourmet food but it was very good. We then had to make a decision. Since the Cape was very foggy, would it be worthwhile driving up there to see it. Since this is the only time in our lives we will ever be here, we decided, what the Hell, let’s try it. 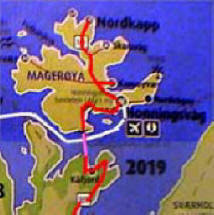 So we walked back to our room and got in the car and at 9:00 headed north to the most northern tip of Europe.